Whoa—here’s the second month in a row with a Friday the Thirteenth. Strikes me as rare. So let’s celebrate with another not-for-the-nervous roundup of ISDP. On February 23rd, Pedro Lopez was renovating the house he just bought in Fontana, California—it had been unoccupied for about three years. While repairing the roof he smelled “a foul odor” coming from the chimney and checked it out with a flashlight. Inside the chimney he found a dead body. A few days later, with the help of medical x-rays, police identified the remains as those of a 48-year-old homeless man who disappeared two years ago. The man had a history of arrests in the area and a petty theft conviction. Police theorize he was probably breaking into the vacant home through the chimney when he got stuck. On February 27, a “bad smell” complaint led authorities in Alabama to human remains in a semi-remote area, specifically a site about a mile from Possum Trot Road in Deatsville. Yes, there is such an address. Google map it yourself—it’s about 30 miles north of Montgomery. 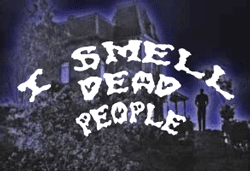 Alabama was also in the news a couple of days earlier when “complaints of a foul odor” led police in Gadsden to a back lot where they found a hearse containing a decomposed body. The body was that of a woman who died in late 2007; her family wanted her cremated but hadn’t signed the papers or paid the funeral home. So funeral home director Harold Watson Sr. put her remains in a hearse and left it in the back lot along with some other vehicles. Watson’s been charged with abuse of a corpse. The next Friday the Thirteenth doesn’t roll around until November. But we’ll doubtless be back before then with the next edition of ISDP—Spring’s just around the corner and temperatures will start rising. Just in from yesterday’s Pittsburg Post-Gazette: A few days after an elderly lady was taken away to the hospital, her neighbors in the Beltzhoover area of Pittsburgh, Pennsylvania called the city to complain about the messy appearance of her house and a “foul odor” coming from it. Upon trying to enter the residence through a rear door, a code enforcement officer discovered a body in an advanced state of decomposition.